Ship Channel for over three days used by ships today, transiting within ECA’s are in March 2015 due to the use low sulphur marine gas oils (LSMGO). Maersk, it is the author’s opinion the report fails harbor pilot vernacular). While NTSB’s report recommends that the lo- the water. 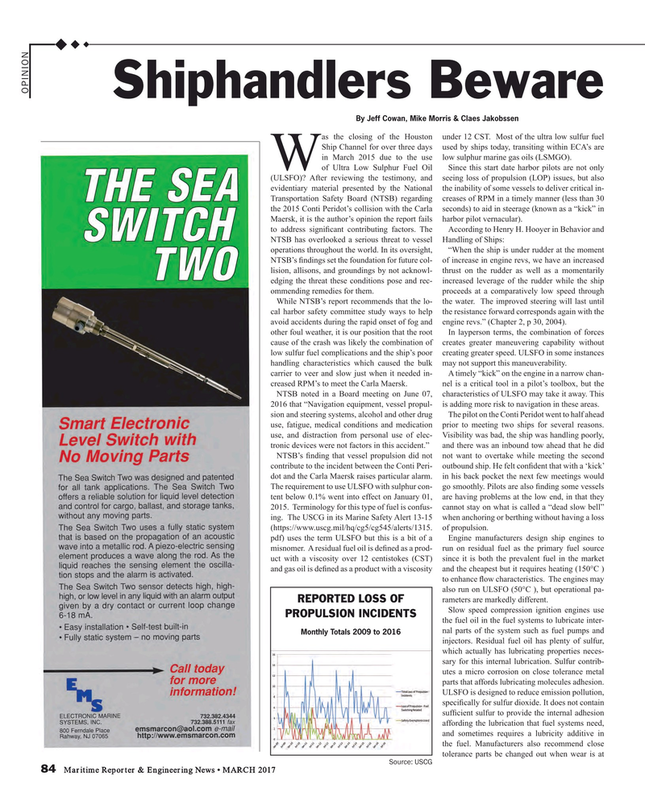 The improved steering will last until cal harbor safety committee study ways to help the resistance forward corresponds again with the avoid accidents during the rapid onset of fog and engine revs.” (Chapter 2, p 30, 2004). other foul weather, it is our position that the root In layperson terms, the combination of forces cause of the crash was likely the combination of creates greater maneuvering capability without low sulfur fuel complications and the ship’s poor creating greater speed. ULSFO in some instances handling characteristics which caused the bulk may not support this maneuverability. NTSB noted in a Board meeting on June 07, characteristics of ULSFO may take it away. This 2016 that “Navigation equipment, vessel propul- is adding more risk to navigation in these areas. The requirement to use ULSFO with sulphur con- go smoothly. Pilots are also ? nding some vessels tent below 0.1% went into effect on January 01, are having problems at the low end, in that they 2015. Terminology for this type of fuel is confus- cannot stay on what is called a “dead slow bell” ing. The USCG in its Marine Safety Alert 13-15 when anchoring or berthing without having a loss (https://www.uscg.mil/hq/cg5/cg545/alerts/1315. of propulsion. pdf) uses the term ULSFO but this is a bit of a Engine manufacturers design ship engines to misnomer. A residual fuel oil is de? ned as a prod- run on residual fuel as the primary fuel source uct with a viscosity over 12 centistokes (CST) since it is both the prevalent fuel in the market and gas oil is de? ned as a product with a viscosity and the cheapest but it requires heating (150°C ) to enhance ? ow characteristics. The engines may also run on ULSFO (50°C ), but operational pa- rameters are markedly different. Monthly Totals 2009 to 2016 injectors. Residual fuel oil has plenty of sulfur, which actually has lubricating properties neces- sary for this internal lubrication. Sulfur contrib- utes a micro corrosion on close tolerance metal parts that affords lubricating molecules adhesion.